"With miles of cable and wire between the power station and ac mains outlet, how can a 6-foot power cord make a difference?" typical customer. 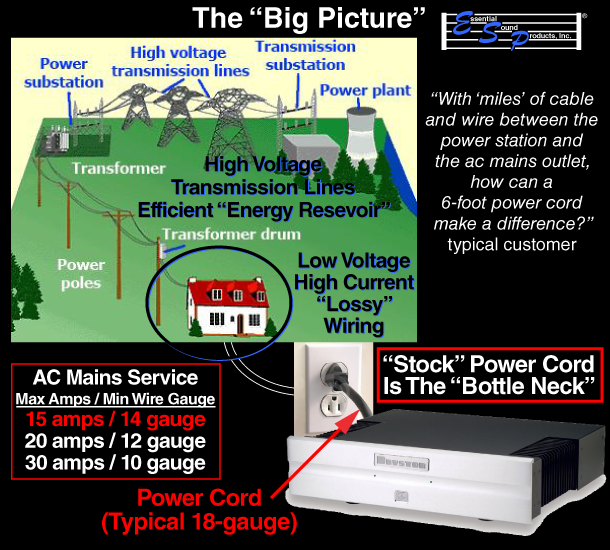 The Stock Power Cord Is The "Bottle Neck"
Electric power travels from the power station through high-voltage transmission lines. The idea behind high-voltage transmission is minimal current flow as energy is carried very efficiently via coaxial cable in a magnetic field. A single transmission line typically carries enough power for multiple homes or businesses, and can be thought of as an "energy resevoir". Outside homes and businesses a "step-down" transformer converts the energy transmission to relatively low-voltage, requiring high-current flow largely within the conductor material. This method of conducting electricity is relatively inefficient or "lossy". For example, typically as much energy is lost in the last few hundred feet distance from the step-down transformer to your home as through the miles of coaxial cable from the power station to the step-down transformer! That's why low resistance materials like copper wire are used to minimize energy loss. Electrical codes in North America define 12-gauge copper as the smallest wire size used for 20-AMP ac mains service; 14-gauge for 15-AMP service. 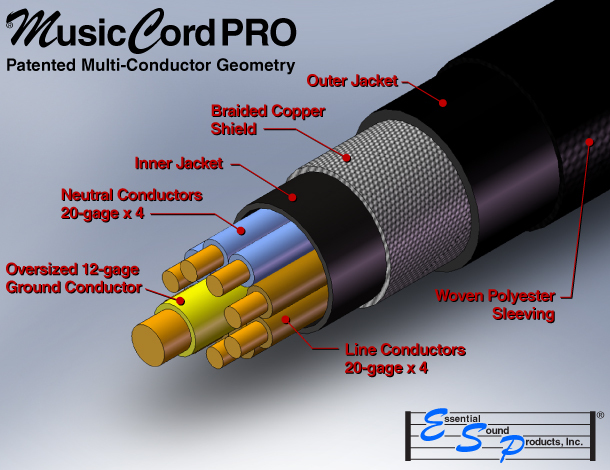 So, why do most audio components come with an 18-gauge power cord? 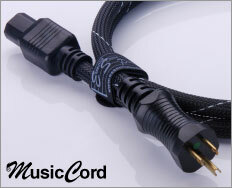 The "stock" power cord creates a relative "bottle neck" restricting current flow. Current flows continuously through a simple resistive device. Current flows only a small fraction of AC cycle. Incoming current flow is modulated by the musical signal. Audio components have complex power supplies that perform several functions including rectifying "ac" to "dc", stepping down the voltage, and storing energy for use as demanded. For most of the carrier frequency cycle no current actually flows to the component, as it is powered by the stored energy in the power supply. 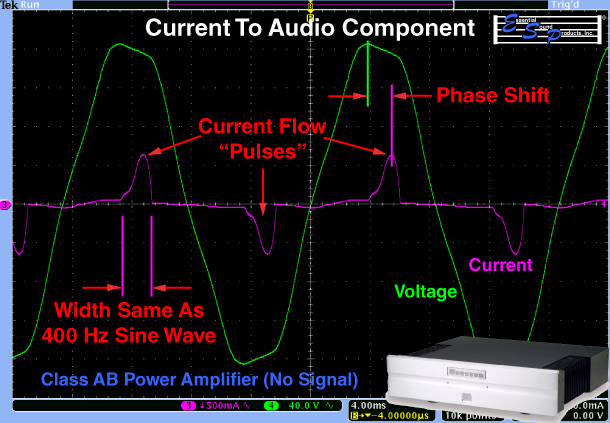 Current flow is "switched" on/off, flowing in "pulses" every half-cycle of the ac mains carrier frequency. 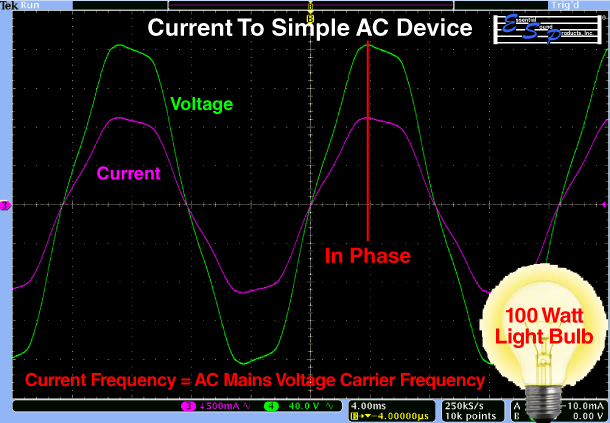 Power supply inductance causes a delay or negative phase shift between voltage and current. Current draw is mainly to refill the suply capacitors. If the current pulse were a continuous sine wave, its frequency would be significantly higher than the ac mains carrier frequency. Current pulse amplitude increases with increasing demand. 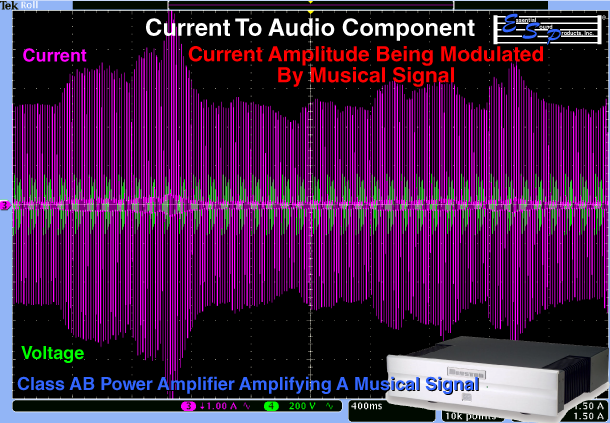 The oscilloscope screen image shows 4-seconds of music being amplified. What is revealing is how closely this modulation follows the musical signal being processed and how dynamic are the instantaneous current changes. 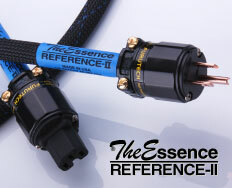 Therefore, not only is flow capacity important, "response time" and "bandwidth" of the power cord matters! is key to optimal performance. To the extent that current flow modulations are restricted or delayed, the power supply cannot meet demand to accurately process the musical signal. This distortion is not comprehended by existing performance metrics. However, it is clearly audible and is characterized by sound quality issues including dynamic compression, harsh midrange and treble transients, and a lack of bass extension. A Null Test is a definitive way to confirm whether a difference exists between two copies of the same audio sample. Two sample-locked copies of the same audio file are played with one copy phase inverted. If the copies are identical, they will cancel, leaving only residual random noise. The DUT (Device Under Test) is a Maselec MTC-1X Stereo Mastering Console. No inserts are engaged, just pure transfer between the input and output of the console. Only the power cord was changed. 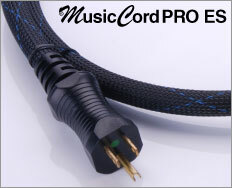 The power cords evaluated included the 18-gauge power cord that was supplied as original equipment, a 14-gauge power cord and a MusicCord-PRO. 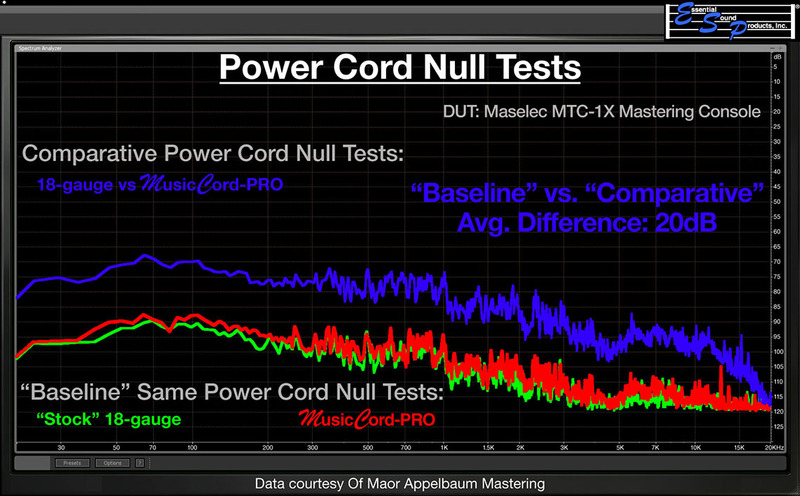 Multiple audio samples were produced with each power cord and null tested to establish “baselines”. Then, samples made with different power cords were null tested. 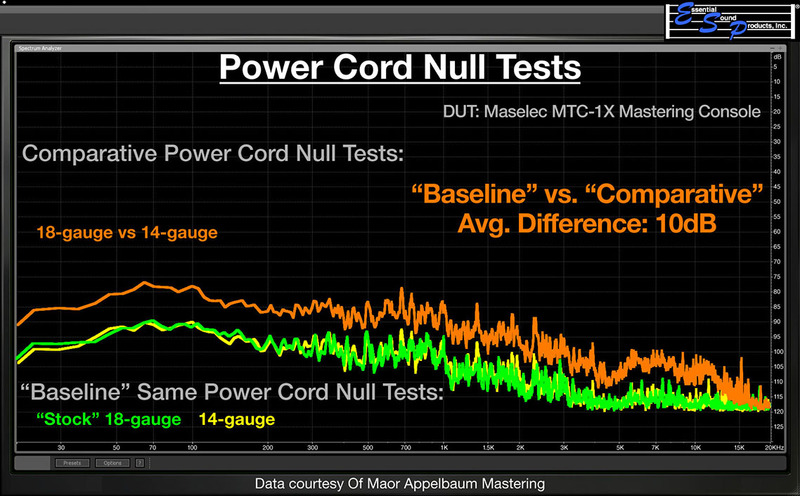 The results of the baseline tests for both power cords and of the comparison are plotted together. Each pairing of “baseline” and “comparative” null test curves reveals significant differences between the baselines and comparavive results over the audible frequency range. 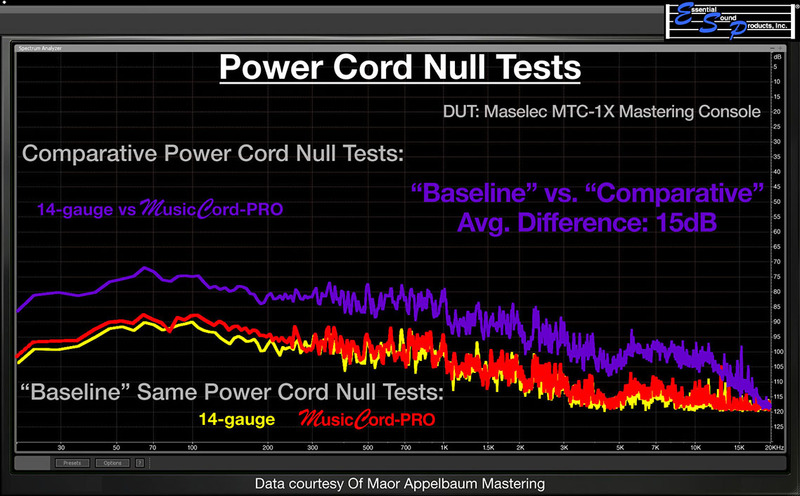 In other words, when comparing for example files made when the stock 18-gauge power cord was connected the DUT versus the 14-gauge power cord, the results show significant information did not null out. This is true for all pairings. 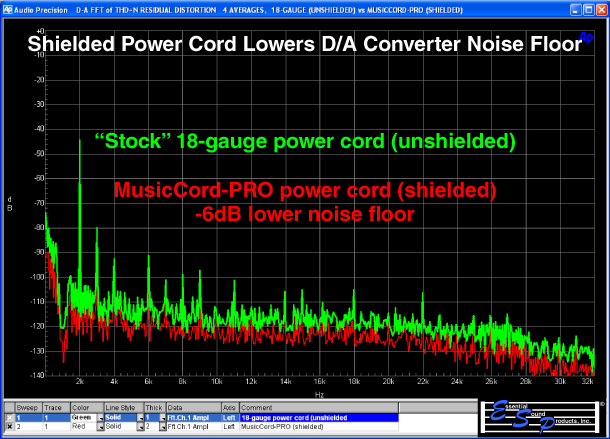 The null test differences range from 10dB to 20dB! 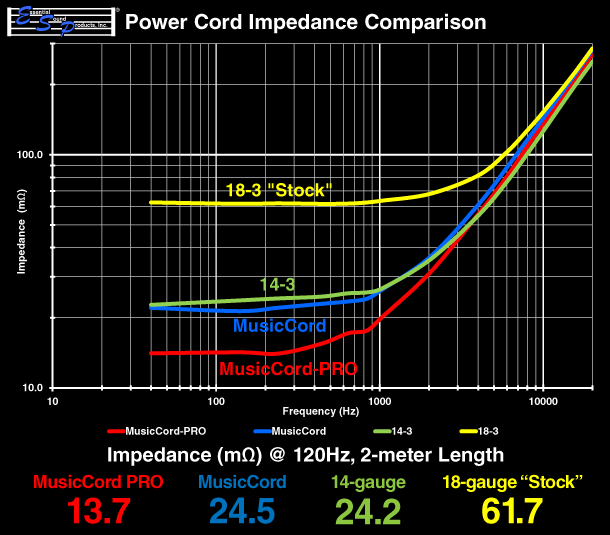 These results confirm that each power cord has a distinct and undeniable impact upon the performance of the connected component. Still skeptical? Download the files and perform the null test yourself. 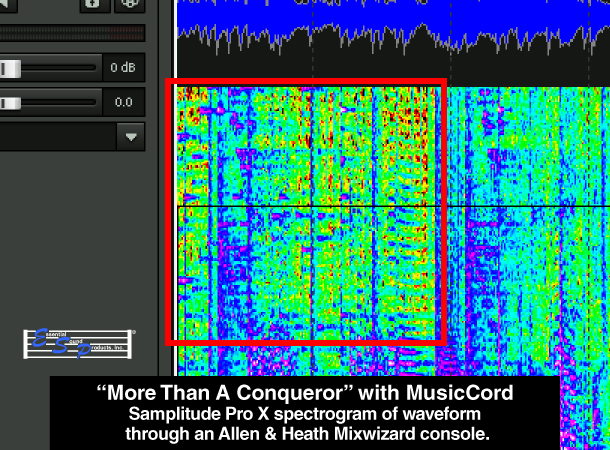 Samplitude Pro X Spectrograms of "stock" vs MusicCord provides visual confirmation that the difference you are hearing is real, not imagined. Use headphones for best audio experience. 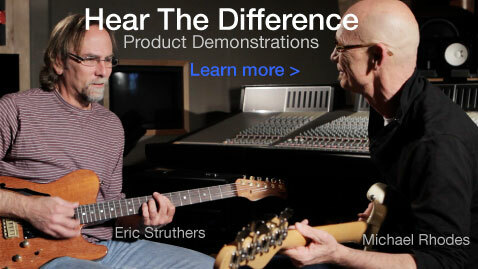 Watch and listen to demonstrations with guitar and bass amps. 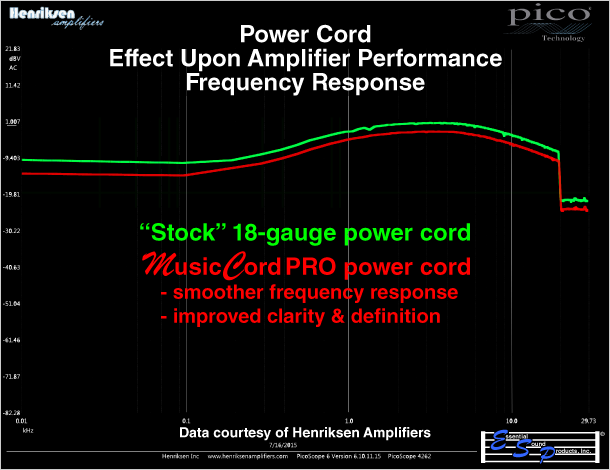 Henriksen Amplifiers compares the performance of their guitar amp with the "stock" power cord and MusicCord. 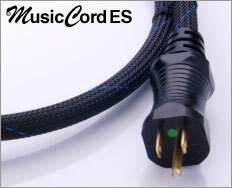 MusicCord reduces Total Harmonic Distortion (THD) by 10%; Intermodulation Distortion (IMD) by 50% vs "stock" cord. 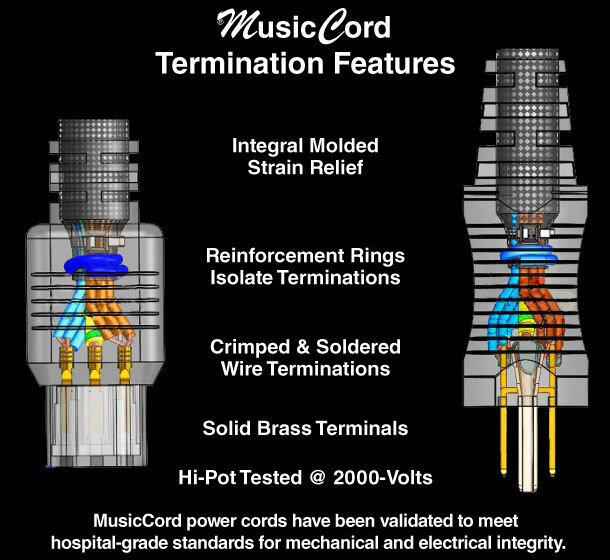 MusicCord's spiraled conductors and shielded cable construction rejects RFI and contains the distortion causing magnetic field that radiates from unshielded power cables. 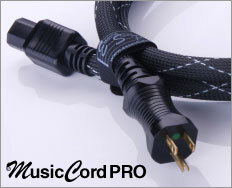 MusicCord-PRO is only 1/6 the impedance of an 18-gauge stock power cord! 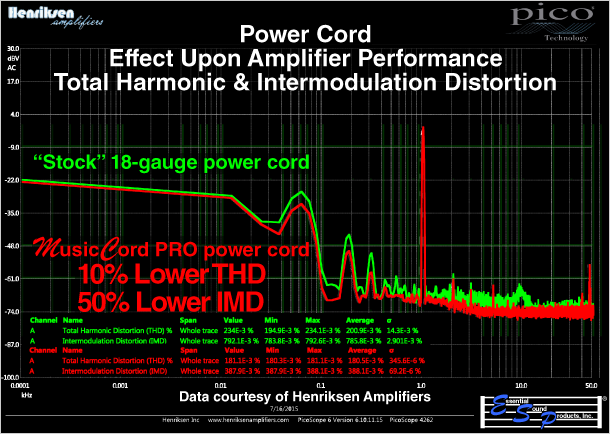 Lower Impedance = More Current Flow! Multiple small-gauge line/neutral conductors combine speed and phase performance with high current capacity. Oversized ground conductor and maximum-coverage braided copper shield eliminates noise. We combine hand craftsmanship with mass-production techinques for for optimal performance. With reinforcement ring and molded strain relief, our terminations will never loosen and cause a "buzz" noise or discontinuity. We back our power cords with a 30-day satisfaction guarantee and lifetime warranty. Click below for more information.